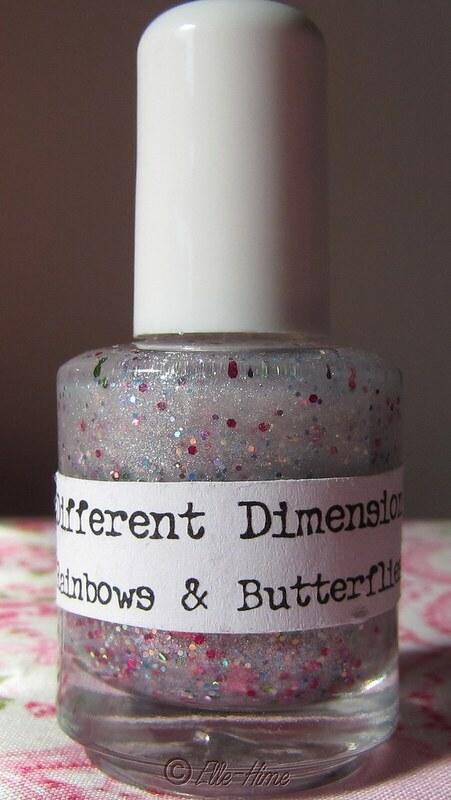 Princessly Polished: Different Dimension - Rainbows & Butterflies! 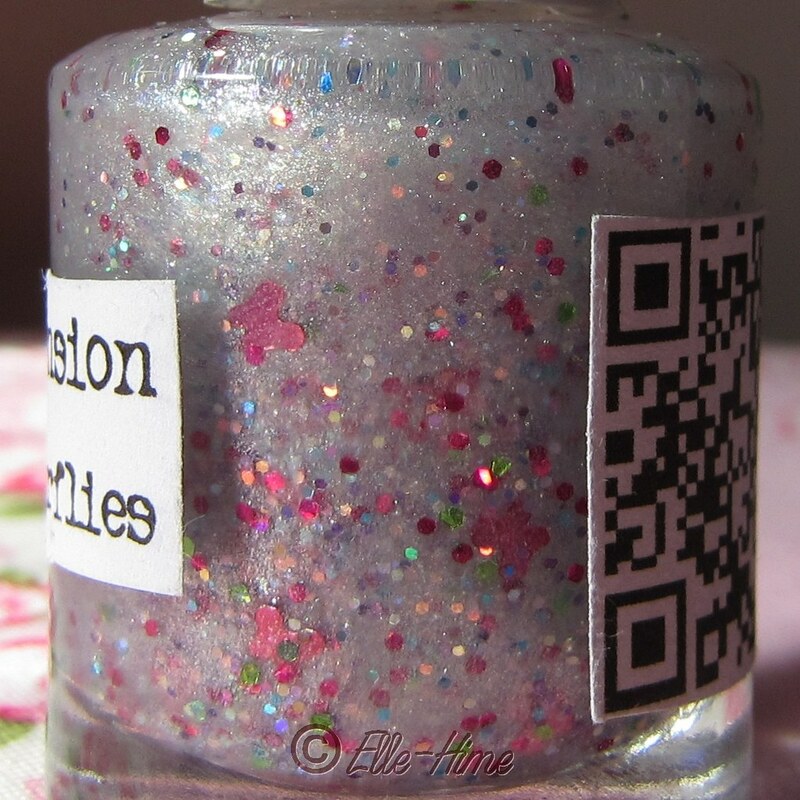 I placed an order at Different Dimension on Etsy at the end of August because I couldn't resist the polish to be had! I have several nail polishes to review (including a custom polish!) but I'm starting off with Rainbows & Butterflies because it is the polish I tried first! A quick word on the polishes in general. Some Different Dimension polishes are now available in mini bottles, but I went with full 15ml sizes on everything, which range in price from $8.50 to $10 depending on the polish. I really like the bottles, caps, and brushes! I appreciate a solid bottle that stays put, and the white caps are comfortable to hold. I haven't had issues with any of the brushes on these polishes and they are easy to paint with. The bottles have two labels, one with the name and another with a QR code that will send you right to the Different Dimension storefront on etsy. While I think QR codes are a great idea for marketing I wish that there was more "empty space" on the bottles because I'm weird and like to ogle nail polish in the bottle. Still, that is nothing to complain about because I could remove the QR code sticker if I really felt it was blocking the view! Rainbows & Butterflies is a limited edition polish. It has a white shimmer base and plenty of glitter. There are tiny iridescent hexes and small hex glitters in pink, blue, and green. And of course the holographic pink butterfly glitters. For these swatches I used just one coat on each nail, which had either black creme polish or China Glaze Lemon Fizz underneath. This polish really pops over black. The super-shimmery base and small multi-color glitters reminded me of a simple galaxy nail design. Also, the glitters spread quite well and give good coverage at one coat. Over a lighter color it is like a sprinkling of flowers on your nails. But the butterfly glitters... much more elusive. It is much like actual butterfly hunting, where you very nearly have one netted but it slips away and completely out of your reach. Yet you can see them, taunting you. No, I'm not complaining. I like the polish enough even without 5 butterflies on each nail, and I figure the more I use it the more concentrated they shall become until eventually they have nowhere to fly away to... But it's worth noting that the butterflies take some work to get to. When I wear this again I'll try two coats of the polish, and will put it over lavender, blue, pink, green, white... Really I think any color would go well with this glitter! I really enjoyed this manicure and I hope to see more limited editions like this one pop up at Different Dimension! Oh, and right now there is a coupon code you can use for 10% off your order. Use FALLSALE at checkout, but hurry, it only lasts until Sept 28th! 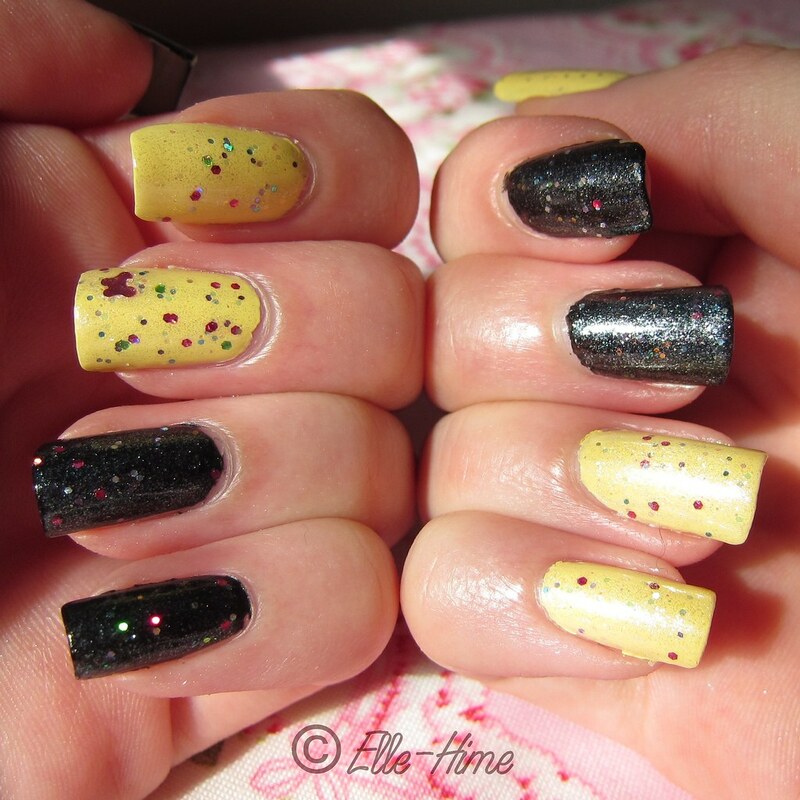 And stay tuned here for more swatches of these indie glitters and glow-in-the-dark polishes!